New York, NY, August 8, 2016	(Newswire.com) - ​​After winning nine major awards in 2015, and two awards at the London International Film Festival 2016, Maria Soccor’s Lords of BSV made its digital television debut on July 31, 2016 on Red Bull TV and is now available on VOD (Video On Demand http://www.redbull.tv/film/AP-1NQTVU81H1W11/lords-of-bsv). Lords of BSV is the latest addition to the online media platform from the Austrian Red Bull company which broadcasts live global events, and an extensive selection of sports, music and lifestyle entertainment. Lords of BSV tells the inspiring story of the breathtaking Brukup dancers in the Bedford-Stuyvesant neighborhood of New York City. As the film is viewed across the world on Red Bull TV, Newark Mayor Ras Baraka has chosen the celebrated documentary to be showcased at a special celebration in September 2016 at the Newark CityPlex Theatre owned by NBA Hall of Famer Shaquille O’Neal. Soccor is especially honored to be recognized in her hometown: Newark, New Jersey. Earlier this year, Lords of BSV continued its international winning streak by taking home two awards at the London International Film Festival 2016 (London IFF 2016) on February 26, 2016. The film was honored with the Jury Award for Best Documentary, and Best Cinematography In A Documentary Feature. The awards continued the tremendous acclaim Lords of BSV received in Europe as well as in America. In 2015, the film was named Best Feature Documentary at the Milan International Film Festival 2015, plus Soccor won Best Director of a Feature Documentary, and Lords of BSV was recognized for Best Music in a Feature Film, at the Madrid International Film Festival 2015. The film added to its list of honors by winning Best Documentary at the I Filmmaker International Film Festival in Marbella, Spain on December 8, 2015. The international honors for the documentary directorial debut by actress/director/producer/comic creator Soccor followed five honors at American film festivals. In the United States, Lords of BSV was chosen Best Documentary at the 2015 Visionfest Film Festival in New York City and the Rahway International Film Festival 2015, received the Audience Award for Best Feature Documentary at the Hudson Valley International Film Festival 2015, and won the Jury Award for Best Documentary at the Long Island Film International Expo 2015. Also, Soccor received the Emerging Director Award at the Langston Hughes African American Film Festival 2015. The founder of the Documentary Channel, acclaimed Emmy Award winner and Academy Award nominated director/producer Tom Neff, calls Lords of BSV, “an example of the finest in documentary filmmaking today.” “It is a perfect marriage of in-depth content with a unique approach to form," says Neff. "Maria Soccor followed her heart to create a unique vision of a unique art form while simultaneously developing a strong underlying theme of dance and art as a way out for inner city youth. Soccor's documentary is a definitive refutation to the stereotype of the inner city youth as violent and uncaring; these young artists are focused, involved, and determined to make a difference.” Neff continues, “Lords of BSV is extremely visual and engaging, impeccably researched and presented, and inspiring to the audience." “As a first time director, I am humbled that Lords of BSV has received national and international recognition,” says Soccor, who produced the short film, Play House, which was screened at the 2013 South by Southwest Festival (SXSW). While Lords of BSV continues to gain accolades, Soccor’s short comedy Cinecoma, which she produced, has been picked up for distribution by Just the Story TV. Also, her new comic series SPEAR, illustrated by artist Rolo Ledesma, launched at the 2015 New York Comic Con in Manhattan. As an actress, Soccor has appeared in over 20 movies, including Playmakers of New Orleans starring Zoe Saldana, in which she portrayed Tracey Austin, Saldana's sister. Her television credits include NCIS New Orleans on CBS, Another World on NBC, and K-Ville on Fox starring Anthony Anderson and Cole Hauser. Soccor is also a trained dancer, and she was inspired to document the stars of Lords of BSV after witnessing their unique talents. "It is the most fabulous urban artistry I've ever seen," Soccor says. "They are the most dynamic dancers in New York City." Soccor’s goal in creating Lords of BSV was to erase the negative stigma and stereotypes about urban dancers. "Dance gives them dignity, a sense of identity, and keeps them from lives of crime," she states. "There is tragedy throughout the entire film, yet the dance lifts them above the negativity surrounding them. Through dance, they find love for each other, and survive." She adds that the art form has tremendous positive social significance. "Brukup is not just a dance, it is a culture," she comments. "Through the art, the dancers overcome poverty and homelessness, becoming better people. BSV serves the community by keeping kids off the streets and showing them how to turn anger into the art of dance. Their dancing saves lives." BSV provides a positive alternative to the negative spiral of street life, despite the lack of funding or facilities. "I want to show the world what they do, teaching students without classrooms, without schools." says Soccor. "My dream is that one day they will have a school to truly nurture and spread their gift." 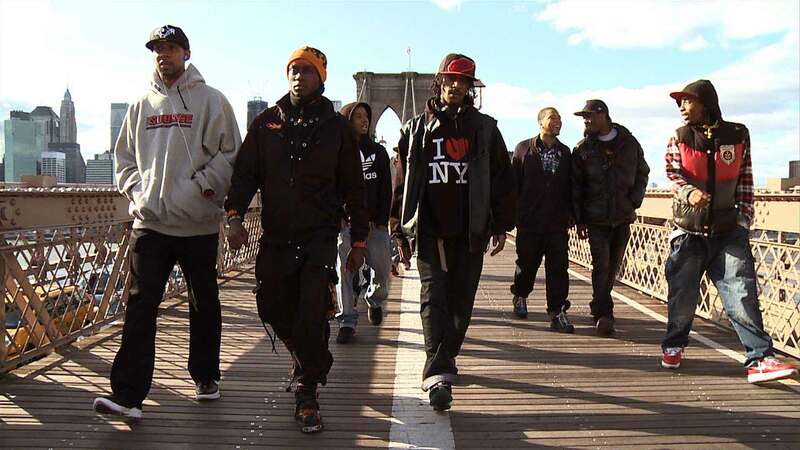 Created in 1998, the Bed-Stuy Veterans (BSV) became kings of the Brooklyn underground dance culture. They are revivalists of a dance style known as Brukup, which originated in Jamaica, West Indies in the early 1990s from George “Brukup” Adams. Brukup is a hybrid dance chronicled in the New York Times that incorporates bone breaking, connecting, pausing, popping, mutation, morphing, ballet and hip-hop, mixed with theatrical miming. About Maria Soccor Productions Inc.
Maria Soccor Productions Inc. is a multi-media company based in Union, New Jersey producing including films, television series, and comic series. Publicist-Simmons Media, Maria Soccor Productions Inc.